Here are models we typically have in stock. 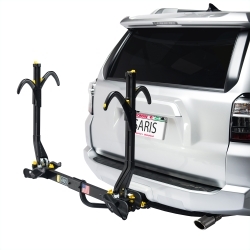 Rack adjusts to fit all bike frame sizes up to 35 lbs. each. Ratcheting straps keep any size bike secure. Protective rubber holders adjust to fit all frame types. Ratcheting straps keep bikes secure. Fits most 2" hitches out of the box. 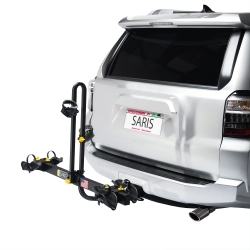 Foot pedal activated tilt allows access to vehicle cargo area. 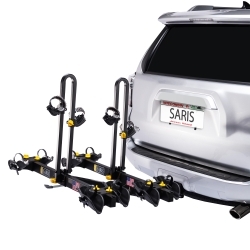 Why buy your rack from us? Professionally assembled before you walk out the door. Documented history of receipts in case of any issues, we will help make a warranty process stress free! Wide variety of models in house, call or stop by to see. Click here to see learn more about Saris. Click here to learn more about Yakima.